The success of the 10th generation Honda Civic has led the manufacturer to leave the Civic unchanged for 2018. Several major changes were added to the 2017 model and remain in this latest line-up. Just like the 2017, the 2018 Civic has kept the addition of a six speed manual transmission as well as the return of the hatchback which is only available in the turbocharged 1.5 liter four cylinder. The exclusive hatchback Sport and Sport Touring trims included the 180 horsepower upgrade in 2017 and the satellite radio for the Civic EX sedan. All of these features can now be found on the 2018 Civic. Trims available on the 2018 Honda Civic include the LX, EX, EX-T, Si, EX-L, and the Civic Touring Sedan. 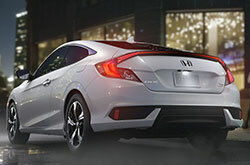 Special features like all LED headlights and C-shaped taillights make the Civic stand out. Nine color options are available, including Cosmic Blue Metallic, Burgundy Night Pearl, and Taffeta White. This in combination with the sleek profile and long wheelbase make the 2018 Honda Civic a sporty, stylish vehicle. The interior is designed for function and style with a central instrument panel featuring a single level display. The center console keeps small bags, drinks, and tablets within reach while the heated seats and eight-way power driver's seat adjustments and comfort. 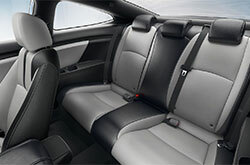 Three cloth and three leather interior options are offered as well as leather accents like seat trim, a wrapped steering wheel and covered shift knob. 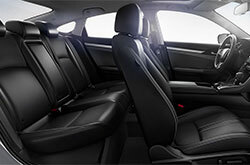 The 60/40 split, fold-down rear seat combined with a spacious trunk makes the Honda Civic a versatile option. The Honda Civic has different engine options available to suit a buyer's taste. The base engine is a sporty 2.0L inline four cylinder with 158hp. Paying more for a faster ride gets you the inline turbocharged 1.5L engine with 174 hp, according to Motor Trend. The Type R Honda Civic will be very sporty with a turbocharged 2.0L four cylinder engine. You need to choose the EX-T trim in order to have a 1.5 liter turbocharge 14 that puts out 174 horsepower along with 167 pound-feet of torque. CVT sedan trims come with the Honda Sensing suite of special safety features like autonomous emergency braking, adaptive cruise control, and lane keep assistance. The 2018 Honda Civic has ABS brakes that automatically sense when your tires have stopped rotating during extreme braking. When the vehicle's handling limits have been pushed too far, the stability control can reduce the engine power or apply the brakes to prevent you from losing control. The driver's and front passenger's heads are protected by front-impact airbags while side impact airbags are designed to protect your torso from side impact collisions. All occupants' heads are further protected by overhead airbags that reduce injuries in the event of a rollover. Occupants are also protected with seatbelt pretensioners that tighten the seatbelts during a collision for optimal seating. The 2018 Honda Civic includes many features that make this car a great value. Come to our dealership today to take a test drive and find out why this car is right for you. 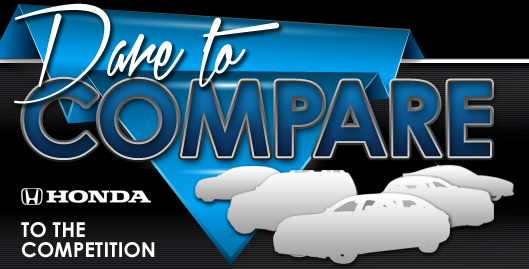 *Taxes, title, registration, administrative fees and Dealer Fee of $795.00 not included. These charges represent costs and profit to the dealer for items such as inspecting, cleaning, and adjusting vehicles,and preparing documents related to the sale. Prices include the listed Factory Offers and Incentives. Please verify all information. We are not responsible for typographical, technical, or misprint errors. Inventory is subject to prior sale. Contact us via phone or email for more details. *MPG Based on 2018 EPA mileage ratings. Use for comparison purposes only. Your mileage will vary depending on driving conditions, how you drive and maintain your vehicle, battery-pack age/condition, and other factors.